Dental implants are considered the premier option for tooth replacement. While all implant procedures follow the same general concept — a titanium post surgically inserted into the jawbone with an attached life-like crown — the installation process can vary. 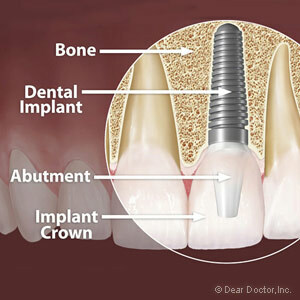 From their earliest history, implants have usually been installed through a two-stage process. In the first stage, the surgeon inserts the titanium post in the bone and leaves it “submerged” below the gum level to protect it from oral bacteria and the effects of chewing and biting. About three months later after the bone attaches to the titanium (a process called osseointegration), the surgeon then performs the second stage by re-exposing the implant and attaching a temporary abutment and crown for the patient to wear while the permanent abutment and crown are fabricated and later attached in 2-6 weeks. In recent years, advancements in materials and design have made possible a one-stage process that allows the implant to protrude above the gum line during osseointegration and shortens the process. After the initial three-month healing period, the implant is ready for “loading” with the permanent crown. The choice between which of these two procedures should be used for your implants will first depend on the type of tooth being replaced. A front tooth benefits from the one-stage procedure for cosmetic reasons because the surgeon can install a temporary crown to the exposed abutment during osseointegration (as long as the temporary tooth isn’t in functional contact with other teeth). An implant for a back tooth, on the other hand, doesn't have a large cosmetic demand so those one stage procedures usually end up with an exposed healing abutment but no temporary crown. The strength of the bone is also a factor. Some bone tends to be softer, particularly in the back of the mouth. There’s a chance the implant could move in this softer bone, adversely affecting the outcome. For this reason, the two-stage procedure can be the preferred approach for posterior teeth as it offers more protection from movement. You can be sure we’ll consider all these and other factors during your initial examination, and then advise you on the best approach. Above all, we want to make sure — whether a one-stage or a two-stage implant process — the result is a smile you can be proud of.